A former soldier has died in Senegal after setting himself on fire outside the official residence of the president on Friday. Bocar Bocoum apparently carried out the act as part of demands for compensation for military injuries. The 36-year-old was taken to Senegal's military hospital, which is close to the presidency. Local media report that he was part of a group of army veterans who staged a protest in the capital, Dakar. But a veteran's spokesman said Bocoum was not a member of their association and that their protest had been called off. 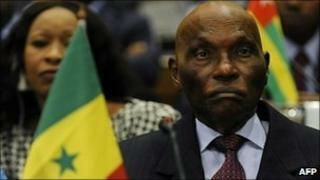 In 2008, another man set himself on fire in front of President Abdoulaye Wade's residence. Keba Diop said the ruling party was refusing to pay him money he was owed. He later died of his injuries. There have been similar acts of self-immolation in several countries recently, including in Tunisia, Egypt, Algeria and Senegal's neighbour, Mauritania.